Ancient, mysterious and remote, Washington State’s Olympic Peninsula beckons to visitors. Although the park was first federally protected in 1909 and designated as a National Park in 1938, much of its acreage remains a vast wildness. Lush rainforests, towering peaks and crashing ocean waves can all be found here. The peninsula is a place of startling contrasts where visitors can experience both the world’s vastness and just how cozy sitting in front a fireplace can be. 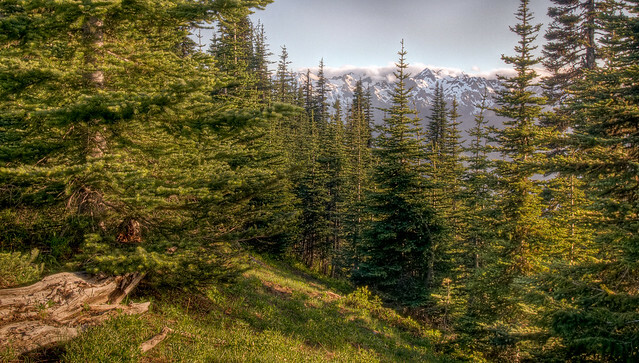 Perhaps the park’s most breathtaking locale is Hurricane Ridge. A paved road makes it easy to access. On a summer’s day, Hurricane Ridge can be overrun with visitors. Fortunately, the expansive views are wide enough to inspire anyone with awe. The visitor center provides enough information to enhance the viewer’s appreciation of the site, but the real attractions are found outside. The area is crisscrossed with trails, some of them requiring no more than a gentle stroll while others seem designed to raise the heartbeat. Regardless of which trail is chosen, the scenery is amazing. Wildflowers dot the meadows in the spring and black tailed deer are easily spotted. The majestic mountains seem to tower on all sides while the crisp alpine air speeds through the few evergreen trees. On a clear, sunny day, it’s easy to see for miles in any direction with every view being exceptionally camera ready. After the breezes atop Hurricane Ridge, the warm waters of a natural hot spring make a welcome change. These can be found at the Sol Duc Hot Springs Resort. For a nominal fee, it’s possible to soak away muscle soreness in one of the three mineral hot springs. The contrast between the cool, crisp atmosphere and the steamy water is luxurious and invigorating. For an even more indulgent experience, visitors can ask for a package that includes a massage and some time in the resort’s sauna. After a tough hike at Hurricane Ridge, this is the perfect way to recover. One of Olympic’s most famous features is its rainforests. These dense, perennially green forests feature annual rainfall that is measured in feet, not inches. Visitors should be prepared to be wet but dazzled as they explore the primordial terrain. The best place to do this is in the remote Queets section of the park. This gorgeous river valley boasts some of the densest and most beautiful vegetation in the region. The trees tower above, effectively shutting out the sunlight. It’s always cool and misty here, but that’s no reason to cut a visit short. Queets’ remote location makes it a lesser-visited spot, one of the few in the park where visitors can feel free to truly commune with nature. The ability to utterly surround oneself in the sounds and scents of the rainforest is definitely worth the trip. The park has some really spectacular lodgings, one of the best of which is found at Lake Crescent. This 1916 historic spot offers cozy rooms at an inexpensive price in the original section of the building. More modern rooms are found in a newer section, but the real highlight is the cabins. Spacious and thoughtfully appointed, these cabins make a great place to spend a few nights. Best of all is the lodge’s lobby where guests can while away the evenings in front of a genuine stone fireplace. With cedar logs crackling briskly on the hearth, there are few warmer and homier sights. As the sun sets, guests can lie back in a leather armchair with their toes stretched toward the flames. Bliss! Kevin Caldwell wrote this article for www.bellinghamairporthotels.com who specializes in helping people find affordable hotels near the Bellingham airport.